Aug 2-4 Michigan Interhash & 32nd Analversary Hosted by the Motown Ann Arbor H3 in Commerce, MI, USA. PRELUBE to EUROHASH Hosted in the Castle "De Berckt" in Baarlo, the Netherlands. Aug 9-12 Nigeria Nash Hash Hosted by the Abuja H3 in Abuja, Nigeria. SOLD OUT (But waiting list is getting cleared off. You may be able to get in). Hosted by the combined hash clubs of Scotland, sailing from Edinburgh, Scotland. Aug 16-18 AGPU 2019 Hosted by the Santo Domingo H3 in Barahona, Dominican Rebuplic. Aug 20-22 Post-lube EUROHASH / Pre-Lube UK Nash Hash Hosted by the Bras & Pants H3 in Scotland. Aug 23-25 Ohio Interhash Hosted by the Renegade H3 in Millersburg, OH, USA. Aug 23-26 United Kingdom Nash Hash Hosted by the Caledonia H3 (combined Scottish Hash Clubs) in Scotland. 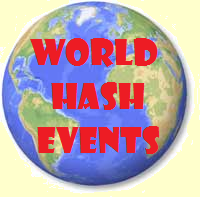 Aug 30 - Sep 1 German Nash Hash Hosted by the Hannover H3 in Hannover, Germany. Aug 30 - Sep 1 Swiss Nash Hash Hosted by the Zurich H3 in Vordemwald, Switzerland. Aug 30 - Sep 2 FHKIT 15 Hosted by the Former Hashers of Korea In Transit H3 in Eureka Springs, AR, USA.